Electronic Air Cleaner Repair & Testing On Your Air Cleaner Power Supply. Labor only to diagnose & repair your electronic air cleaner power supply. We are the only company in the country to offer electronic air cleaner repair & diagnosis service for both consumers and contractors alike. We perform this service on Honeywell, Trion, Electro Air, White Rodgers, Trane, Carrier, Sears and many others. Mother boards can NOT be repaired since the individual components on the boards are NO LONGER available. We are however, able to determine IF the mother board is bad and sell you a replacement mother board if needed. 1. Purchase the DIAGNOSTIC service on the website. The shipping charge in the purchase is the return shipping paid in advance. 2. Remove the Power Supply Assembly from the Air Cleaner (FOR FURNACE MOUNTED AIR CLEANERS IT IS THE METAL BOX THAT IS BOLTED TO THE TOP OF THE AIR CLEANER CABINET OR THE DOOR ASSEMBLY ON CERTAIN MODELS). 3. 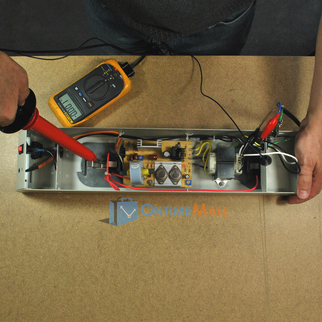 Ship us your entire Power Supply Box using UPS or FedEx. This way you can track your shipment and have proof of receipt/delivery. 4. Upon arrival our technicians diagnose what is wrong. After determining what is wrong, we email you the results and tell you the parts cost for repair. 5. You then approve the repairs and we install the parts for you. Parts cost is not included in the Diagnostic fee but the labor to install any needed parts is. 6. Your Power Supply is then shipped back to you ready to be remounted on your air cleaner. Turn around time is normally within 1 week. I was VERY PLEASED with your service. It was prompt and you know what you're doing. A local furnace repair company wanted to charge me IN EXCESS of $450 (and they would NOT have diagnostically serviced MY printed circuit). Even with shipping, your charge was LESS THAN $100. Being on a fixed income, this was VERY MUCH appreciated. Excellent job in finding the failure in my high voltage power supply. The electrostatic air cleaner burned out on our older (about 23 yrs old) furnace. I had the choice of having a filter type system installed, for about $1000 (the furnace company that I use does not use EAC's anymore), or sending the cover of the EAC into On Time Mall to repair the power motherboard which, although not cheap, was less at about $700 with shipping and testing. I choose to keep the EAC and I'm glad. The repair and return mailing was quick and everything works like new, and I still don't have to replace filters regularly. My Trane Clean Effects power door was tested and found to have a "high voltage" fault. Unfortunately, Trane will not supply repair parts for this air cleaner and will only sell a complete replacement door at a cost that exceeds that of a complete new system. Ontimemall techs attempted to reduce the power output for me, but upon re installation of the door, this attempt to get more service from the door proved unsuccessful. Ontimemall did all they could and their efforts on my behalf are much appreciated! I will now pursue obtaining a new air cleaning system and will continue to utilize Ontimemall services, should they be required in the future! This company is one of a kind! and is my lifesaver since I am allergic to house dust mites. They have quickly repaired my electronic air cleaner (EAC) twice in the past 6 years saving me hundreds of $$$. Their expertise has kept me from having to totally replace the unit. When my EAC is not functioning properly, my furniture is covered in dust in a few days following an extensive cleaning by my housekeeper. When the EAC is working, house dust is not visible on the furniture for weeks. They return phone calls and emails in a very timely manner. I give them 10 stars! THANK YOU FOR EXISTING! Great to have a service be exactly what you wish for. I was called an explained the problem and price was quoted, return time as quoted, and product fixed as advertised. Very slick and dependable service. Thanks so much. It got looked at and tested OK. At least I know it is putting out the correct voltage. When it was new it had a sharp snap at the test button. Time around was fast, I would use them again. Even though the salesman knew the date of my unit (from 1971), he indicated there was over a 90% chance they could repair it. On testing, they determined the parts were from the '70's and obsolete and they couldn't repair it. They also did not which part didn't work. The testing did not give me ANY answers that I did not already know. 2 stars because the sales person was polite and responsive to my questions---- No stars for the testing process. Great to have a service be exactly what you wish for. Price as quoted, return time as quoted, and product fixed as advertised. Very slick and dependable service. Thanks so much. Service was fast and efficient. Great idea to get a repair without the high cost to replace or incur the price of a house call by an HVAC company. It seems to be working fine. Repairs were done quickly and return was prompt. Hello I was very pleased to do business with you. I placed my order by phone and despite my English is not perfect it went very well. When you have checked the power supply of my electronic filter and you have found that worked perfectly, Mr. Jay Guliano informed me by phone that he will send by email solutions that could solve my problem. It has been very appreciated. Thanks. Excellent service and communication from On Time Mall. I would use them again. OnTime Mall delivers as advertised. I shipped my unit to them they found the problem, called me to discuss the repair. Cost was reasonable. Repair was fast and unit was returned to me very quickly. My only quibble is that after my unit was delivered to them I did not hear from them. I sent 3 emails via their web site and received no reply what so ever. I find this less than 4 star service but I'm not sure who is at fault. The emails go to "sales". The person who finally called me was a repair tech. So it looks like "sales" falls down on the job while tech repair delivers 4-5 star service. Quick and excellent service. I would recommend to anyone.